On the 18th November 1948 an informal meeting was held to discuss the formation of a choral society to present major choral works in Sunderland. 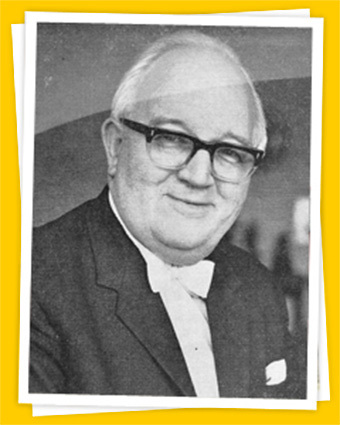 The prime movers were the Rector of Bishopwearmouth Church, Rev.J.F.Richardson, and Clifford Hartley, the choirmaster and organist of the church. The nucleus of the choir were to be the men of the Parish Church Choir and the Senior Girls Choir of the Bede Girls Grammar School, Sunderland, where Mr Hartley was Music Master. These were to be augmented by other singers subject to approval. On the 23rd December 1948 these proposals were formally agreed by a temporary committee and it was proposed that a performance of ‘The Creation’ by Haydn be held in March 1949. The formal name for the choir was agreed as Bishopwearmouth Choral Society (there was already a Sunderland Choral Society in being) though it would have no direct connection with Bishopwearmouth Church. The concert took place as scheduled, the choir numbered over 80 singers and the soloists included Isobel Baillie. The accompaniment was by organ, played by Dr.Conrad Eden, the organist of Durham Cathedral.The Society began slowly and after five years had become established. Although the Sunderland Choral Society had now become defunct, the Society did not change its name. By 1956 it was performing two concerts per year and using regular orchestral accompaniment. By 1960 with a membership of over 80 the Society was performing in the Empire Theatre, Sunderland, as well as in Bishopwearmouth Church. Clifford Hartley who had been chairman and conductor of the Society from its inception retired from conducting in 1974, his final performance being that of the Bach ‘B Minor Mass’, the fifty sixth concert by the Society.Since then the Society has continued to flourish. Its membership, which is auditioned, though occasionally variable has remained relatively stable at 80 singers. It has since its inception performed nearly 150 concerts, in addition to some for charitable purposes, and has since 1993 sung under the baton of Mr.David Murray, a highly experienced and professional musician well known in the North East. The Society rehearses weekly on Wednesday evenings, in The Minster Church Sunderland during the months of September to June and performs three concerts per year, all of which are held in Sunderland Minster.